Lately I've been thinking about some of the Xmas traditions that I grew up with & what I'd like to continue with Sprout. 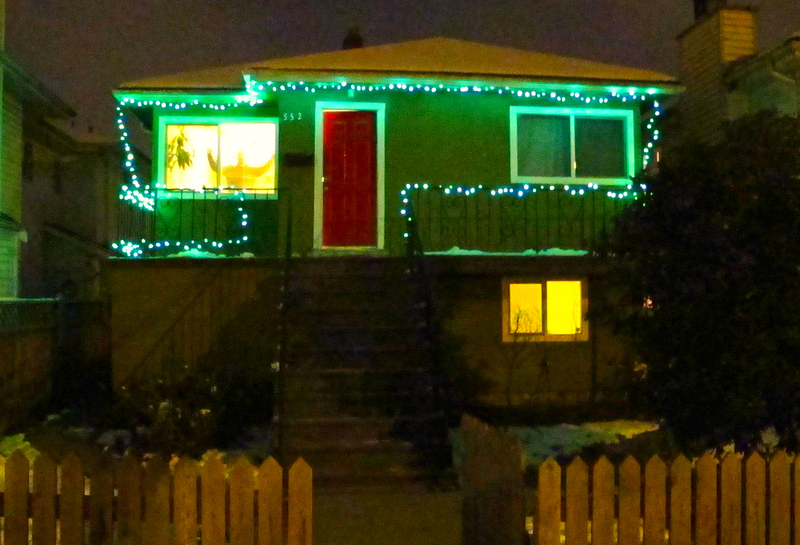 Getting the lights up on the outside of the house was just the start. I want to get a real tree this year (have never actually done that since leaving home) & we'll definitely put up our stockings, though I'm not sure where, as we have no fireplace! I've also been researching shopping mall Santa photos online. It seems that at most malls, the photo store just makes a bunch of money off the Santa pics. However, Metrotown has photos by donation & the proceeds go to the Burnaby Christmas Bureau. I think if I'm going to fork out $5-15 for a pic of Sprout crying while being held gingerly by some strange man in a red suit, I'd like it to go to a charity. I also want to go check out some of the Xmas events around the city, like the Festival of Lights at Van Dusen, the German Christmas Market, the Woodward's Windows around downtown, the Christmas Train in Stanley Park & maybe the Trinity Street Light Festival too. I know Sprout won't really get much out of them this year, but I see it as research to see what he might like next year. Oh, & it might actually be fun for us too! It's the first year in ages that I've been off work all of December, so I have time to enjoy this stuff, while still getting all the 'work' of Xmas done (organizing all the visiting, writing & addressing cards, shopping or making gifts for nieces & nephews, decorating, maybe even some baking) on time. Are there any Xmas-y events you're planning to go to? Any recommendations? What's your favourite Xmas tradition from your childhood? Do you still do it these days? We don't do the Christmas outings...although we usually have a ceremonial cutting down of the Christmas tree, with hot chocolate and hot dogs roasted over the fire..and J and I like to make a gingerbread house every year. But this year we are making a train instead! I think we will pick up more family traditions as the kids get older, dependant a bit on what they like to do, of course.